If you wanted to make a ping-pong ball, what would you have to do first? The first thing you would have to do is to set up a mold for the ball because without a mold you would not be able to produce the ball. The necessity for a mold applies to every article. For example, let us say you want to make an artificial flower. Once again, the first thing you would have to do is set up a mold and only in that way could you produce such a flower. 1. The Creator of these plants, trees, and flowers is God Almighty. He has both scientific and spiritual molds for every plant and flower within His wisdom. With His endless wisdom, He has appointed different, providential forms for every plant. And with His limitless power, He pushes atoms and elements into spiritual molds and creates beings. All of these instantly occur by His will. (A) There must be as many material molds as the plants in the soil. By using these material molds, the soil produces greenery. Nevertheless, there is a work of art present, and a mold must be used for this work of art to come into view. Without a mold, the creation of these orderly plants would not be possible. Since a material mold is necessary even for an artificial flower, it is impossible to create those endless flowers and plants without molds. In that case, there are 500,000 molds for the 500,000 different types of plants in the soil. It is not possible for “rational minds” to accept that there are 500,000 different molds in the soil. And it does not just end there with 500,000 different molds. Every individual plant amongst the different species has a different form. Its flowers and leaves even vary amongst its own species. 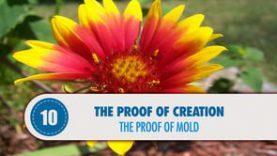 In that case, it is not about accepting that there are 500,000 material molds in this soil, but about admitting the presence of material molds when taking the created plants into consideration. No plant looks like another and every single one requires a specific and unique mold. (B) If we are unable to accept that there are unlimited material molds in the soil, which we cannot accept, then we must accept the presence of spiritual and scientific molds since an orderly work of art cannot be created without a mold. If the mold is not of material, then it must be scientific and spiritual. A handful of soil should know the anatomies of all plants, their shapes, their formulas of creation, the leaves on every plant, their flowers, fruits, etc, and with its power, it should propel atoms to these scientific molds. And this is only possible if the handful of soil has the same amount of knowledge and power as God. If we are to summarize again: The plants, flowers, and trees that come out of the soil have been created so perfectly that it seems as if they have been molded. After seeing the extraordinary creation that is in front of our eyes, we should say, “God is the Creator of such greenery. Within God’s endless wisdom, there is a scientific and spiritual mold for every plant. With the power of incitation, the atoms enter these molds and plants are created”. 1. There are material molds for every plant in the soil and the soil uses those molds to create these plants. In that case, when the plants in the potting soil are taken into account, then, the existence of the material molds will be accepted. 2. If the soil does not have material molds, then it must have spiritual and scientific ones. The anatomy of every plant that has been created should be known scientifically and through the use of power, particles should be propelled into spiritual molds. Do those who do not accept the endless wisdom and power of God and who deny His existence not feel ashamed when they accredit a handful of soil with having as much power and knowledge as Him? Or, do they actually accept that that there is a material mold for every kind of plant that is found in the soil? Is there any other option than the ones we have listed above that allows them to explain the creation of those things? Or, do they close their eyes and pass everything off as a “coincidence?